Wynns ran a wide range of ex. military vehicles. Although the Pacifics and Diamond Ts get the publicity, there were many other types. First off is FDW 752, one of the Thornycroft Amazon / Coles cranes. The casualty was a Mammoth Major from Newport. Also in attendance is a Scammell low loader, a WLF and a Matador. 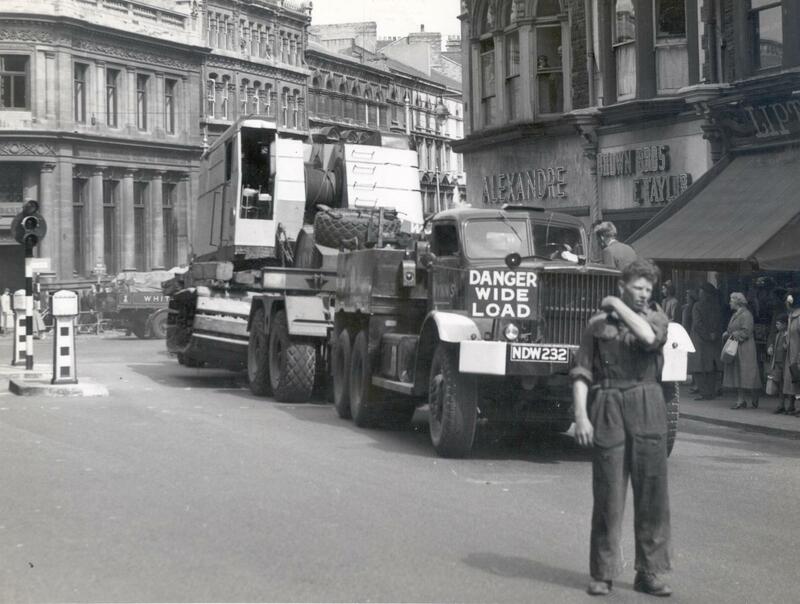 This load with Diamond T NDW 232 in the lead is passing through the centre of Newport. I asked Percy Wynn why they went through the middle. "It was the only road" There was no by-pass, one bridge over the River Usk suitable and only the main street was direct and wide enough. The cab is the original - always looked the best design. Totally agree there, the in-house Wynn's cab was functional but added nothing to the look of the vehicle. That said I have rarely seen a re-cabbed T which looks anything like as nice as the original. Okay, they are stupidly small but fitting a larger cab does upset the proportions. However, they were working vehicles so functionality came first. That and the fact that the proper cabs had rusted away....Or where some of the Wynns fitted cabs to replace Rag-Tops? That they did. I have also seen a few pictures of a very bent cab after what appers to be a roll-over! I do not however recall seeing any soft top cabs - interesting comment Mike, I will have to check up on that one. 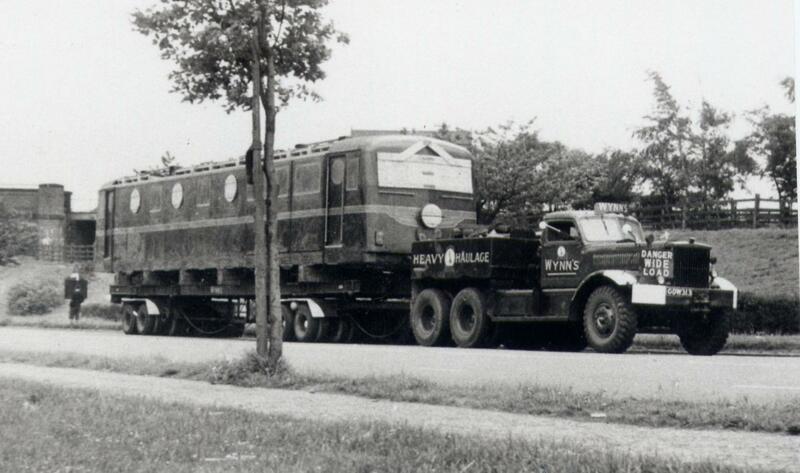 'With rust and old age striking hard on the cabs of Wynn's Diamond Ts, the fleet took on a new look as they were replaced with a bigger unit...." Photo dated 1959. Always an interesting yard to visit. This visit showed Matador WDW542K - still working for a living - and PDW321, the Diamond T wrecker. Bowen's tipper was a recovery casulty. I always noted these because they often became part of Wynn's fleet. Don't recall the bus on the right though! 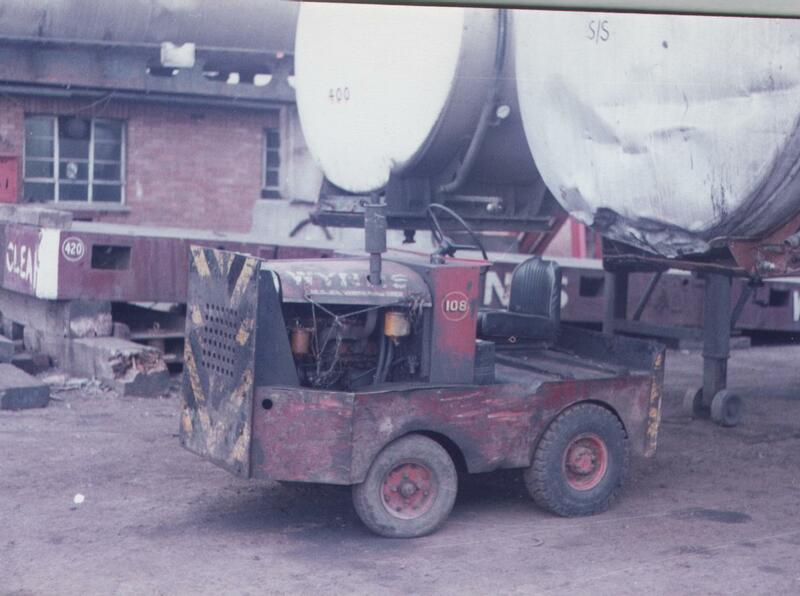 Yard Shunter 108 was ex Royal Navy. For saw service with Wynns. 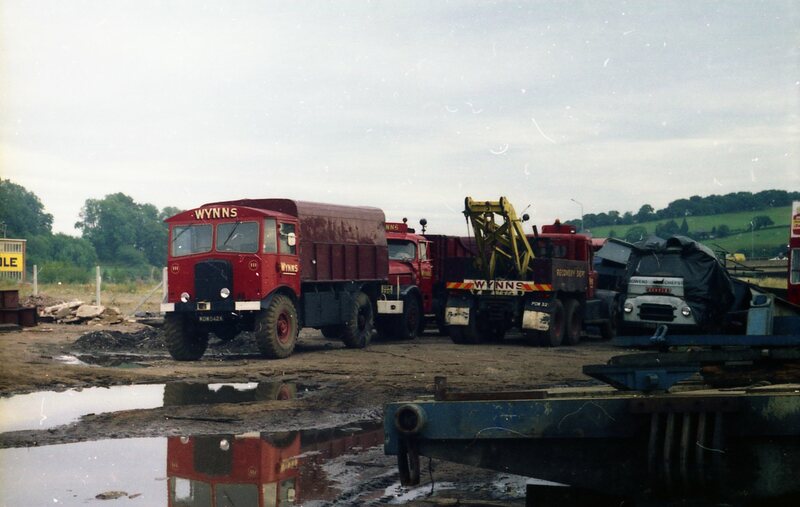 One of eight Foden GS flatbeds used by Wynns. 177/EDW602 was registered in April 1948. Two of them went off to BRS on the first nationalisation and four more went with the second. 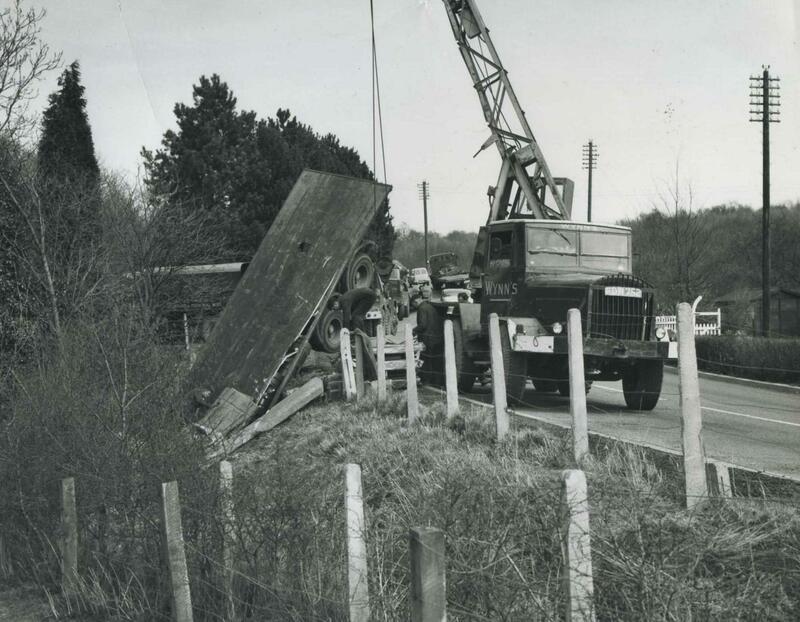 The crane is a Lorain bought in August 1958.[268/PDW504]. 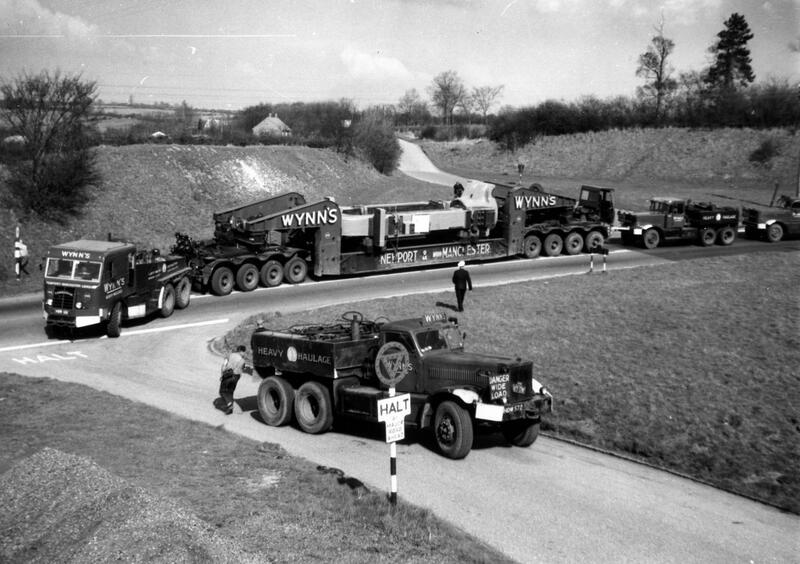 It later moved to sister company Wynn Engineering. I should saw registered not bought. 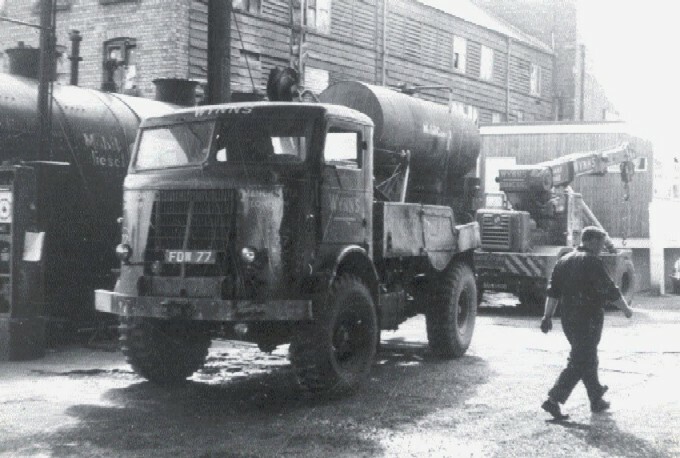 The company always had military units in the yard either for spares or sometimes to register and use when needed. Seen in the same yard as the photo above. Going by the tidy state of the yard, I think this is likely to be one of the last three of the seven Pacifics with registrations. There were a couple of armoured chassis in the [then] second yard. I assume these were used as a base for the later builds. 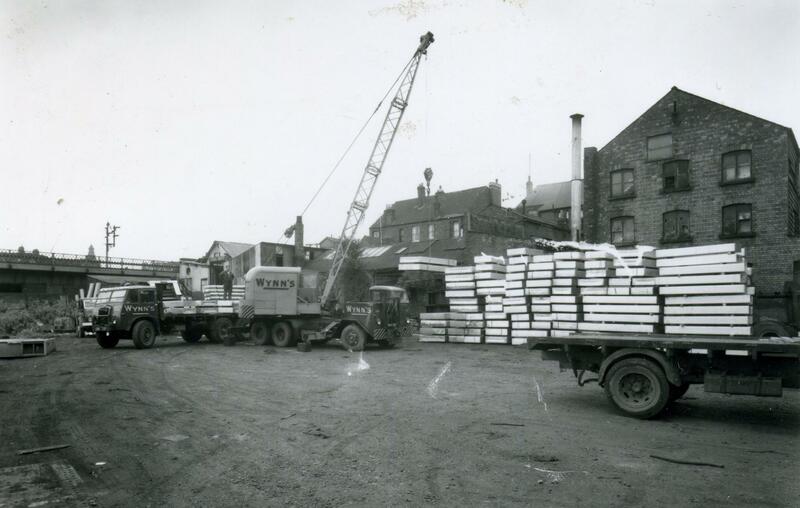 Here a picture of a Diamond T hard at work for Wynns. They were all DG/10s with single rears and hoop/sheets bodies. They would have all come from an auction but I have no records of these being sold anywhere at that time. Judging by the chassis numbers they were most likely all bought at the same time. I only have details of them running as flats with Wynns or BRS. 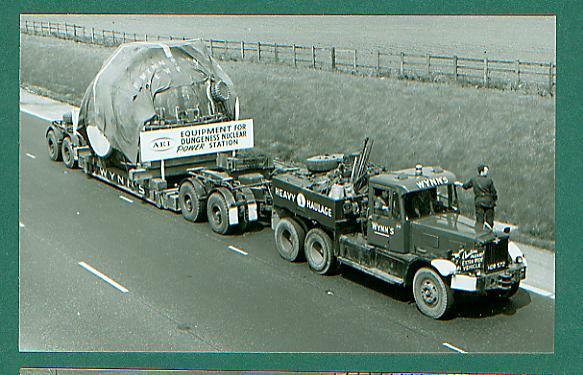 Somewhere I have the two Pearse Haulage ones in a line-up. Wynns owned 14 FWDs [including one not operated]. 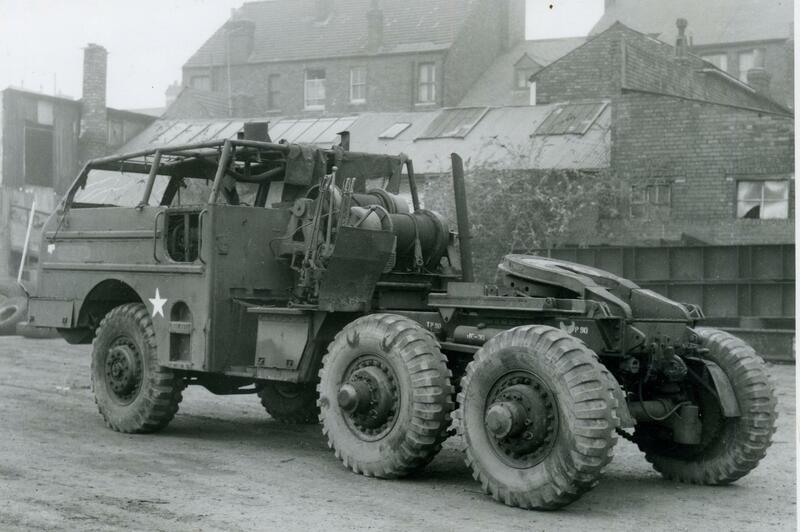 They were eithwer the lend lease variety of c1944 or post war Nash & Morgan built up these timber drags. The side mounted spare is a similar design to that mounted on the Matador timber cranes. 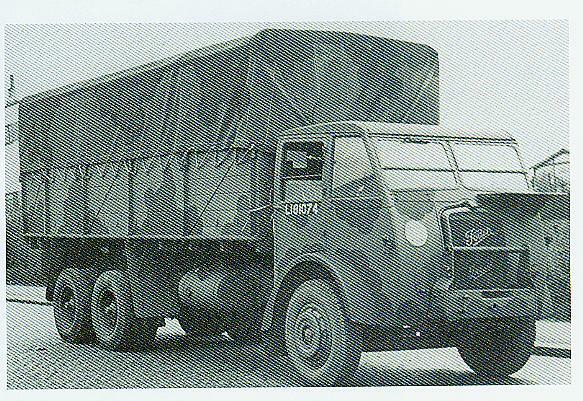 FDW77-79 with matching fleet numbers were the last to be built. Seen herein the yard entrance with Iron Fairy 270 behind. 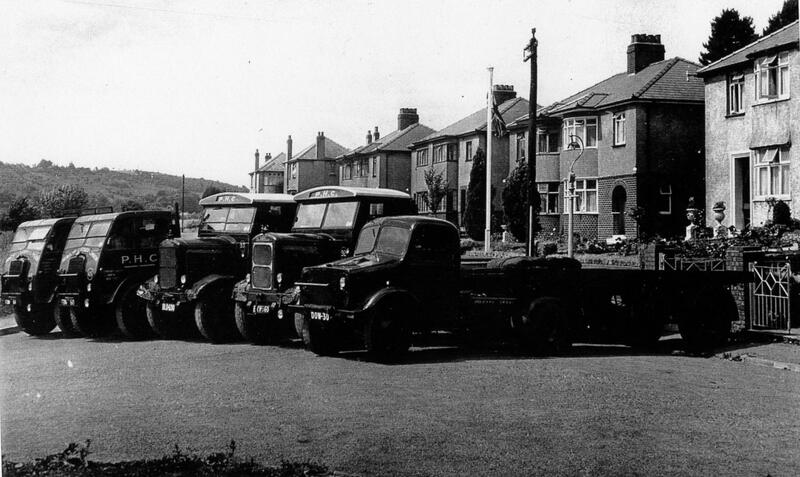 A posed view of the Pearse Haulage Company prior to nationalisation in 1949. The two Fodens FDW60/61 are standing with two ex Fisher Renwick Scammells 92/3 BVXV560, BLO690 and a Bedford OXC xwd DDW30, chassis 18560 which seems to have been a quick buy to swell the PHC fleet. PHC was acquired in the 1930s and the vehicles, mostly Scammells and steamers were used "on loan" to Wynns through their life. UW167 had a small "P" above its fleet number. 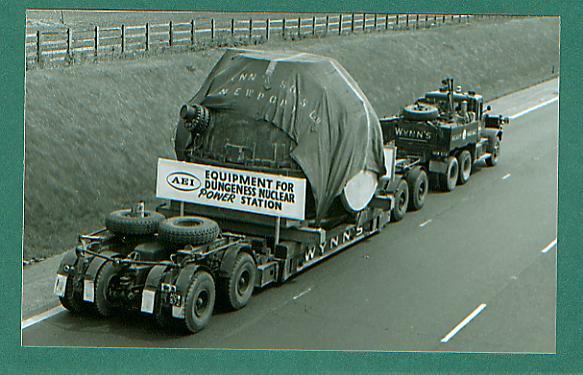 The description on these Alcan photos says "167 ton casting from Sheffield to Rogerstone via Coventry, Buckingham, Bicester and Chipping Norton. Presumably it was off loaded for the rail crossing at Gloucester. Diamond T 266/PDW321 is leading followed by Pacific 193/HDW122. In the second view another DT 212/HDW572, Wynns 9th, a 981 model, has arrived - on tradeplates! 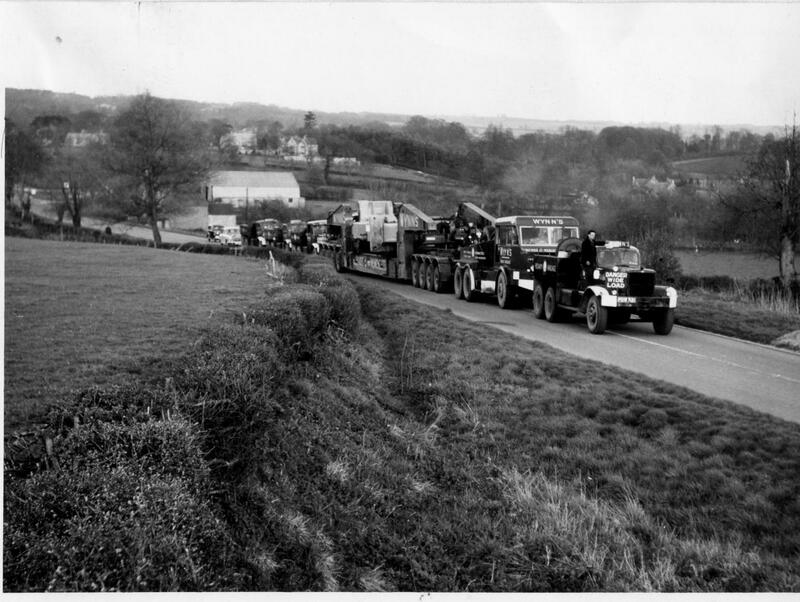 It would have been an experience to watch this going through the Cotswolds.